It’s important to note that as nail techs we walk a fine line between being nail repairmen and playing doctor. There are many instances when a client should be sent to a doctor. Nailments like pseudomonas (often improperly called nail mold) or paronychia (infections of the skin around the nails) are not battles we should fight on our own. When you’re facing a true infection it’s imperative that you refer your clients to a medical professional. There are a lot of tried-and-true home remedies that techs love to share and promote. We want to be the one who saves the day and we also want to fix issues quickly so we can move on with our client’s services — but that’s not always possible. I highly encourage any nail technician who tries to cure bacterial infections herself to stop this bad habit and start referring their clients to a reputable doctor. As a bonus, by partnering with local doctors and podiatrists you can actually get more business. (When I partnered with a podiatrist in San Diego, I received many client referrals.) It’s a great way to cross-promote, learn, and have the blessing of a licensed medical professional. When dealing with otherwise healthy nails, nail techs can use their knowledge to address one of the most common issues that plagues many nail clients: delamination. Delamination is a fancy word to describe nails that are peeling and have a separation of the layers of the nail plate. It’s characterized by peeling and flaking at the free edge. There may also be visible signs of the nail plate being ripped off through the improper removal of artificial enhancements. Delamination is most commonly caused by clients or nail techs forcing and peeling off gel-polish or nail enhancements. When the product is forced off the nail, it normally takes a lot of nail with it. It can also be caused by dryness. 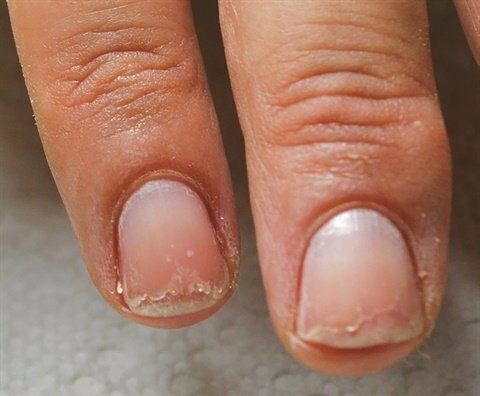 As with most common nail damage, the only true remedy is to allow the nails to completely grow out and repair themselves, but we all know that clients don’t like waiting, especially when it can take up to six months to completely regrow a fingernail. Fortunately there are some remedies available to get nails back in to shape more quickly. I have successfully used Famous Names’ IBX to repair delamination. IBX is a monomer-based product that soaks into the first few layers of the nail plate and fuses them together through a combination of heat-induced penetration and UV light exposure. It can be used as an add-on service to create additional revenue for your business [see sidebar]. The treatment system contains two products; the first is called Repair. Repair treats large divots in the nail and aggressive delamination normally caused by the improper removal of artificial nail enhancements by filling in the gaps. The second product is IBX, which is great for strengthening natural nails and fixing more moderate to low levels of damage. It is also a great preventive treatment that can be applied to the surface of the nail before each service to protect and strengthen the natural nail under any type of enhancement — whether gel-polish, hard gel, or acrylic. It’s also effective as a treatment for those clients who want to grow their natural nails. One word of caution: Since this is a monomer-based product, make sure your client does not have any allergies to monomer. Another excellent remedy for delamination is moisture. We all know we don’t moisturize our own nails enough and our clients are even worse. A lot of damage to the nail can be avoided by keeping the nail plate and surrounding area moisturized. This does two important things: It keeps the nail plate flexible as it grows out, which prevents splitting and peeling, and it also helps to nourish the surrounding skin, nail bed, and cuticle area, which are all vital areas when it comes to growing and maintaining healthy nails. Our nails are like little sponges. Think about your kitchen sponge and what it does when it dries out or comes in contact with water. Our nails are identical in nature. When we don’t have any moisturizers or emollients in our nails, they’re susceptible to swelling and shrinking just like a sponge. Over time this process leads to dry brittle nails that split easily and peel. A lot of clients don’t realize that moisture is a key factor, so they opt to get some type of enhancement because they can’t get their nails to stop peeling and breaking. But even nails with enhancements need moisture in order to prevent lifting and separation. The key to keeping nails moisturized is to apply products that prevent evaporation. The definition of a moisturizer or an emollient is just that. We want to moisturize all the layers of the nail plate we can, so that there is no room for water to fill the nail layers and cause them to expand. By keeping the nail plate moisturized, it also means that there is no evaporation of the water so there’s no shrinking or drying out either. So what is the best process for our clients to keep their nails moisturized? Cuticle oil is probably the most popular go-to when it comes to product recommendations; however, cuticle oil is effective only when used regularly and re-appled after handwashing. It’s best for clients who can be diligent about their at-home care. For time-pressed or forgetful clients, I encourage the use of thicker products that can be applied before bed at a time when the product won’t get washed off. Balms, salves, and ointments are really great for this. Look for products with main ingredients that help prevent water evaporation and penetration. You can purchase the small sizes and offer them to your clients as a gift with service. This is a great way to raise your prices and wow your clients with an excellent customer experience. The client can apply her treatment before bed, rub it all around their nails (including the underside), and go to sleep without having to worry about it rubbing off or getting everywhere. As a result, her nails will be healthier and her services will last longer. Offer your clients a rehab package of weekly or bi-weekly treatments to keep them on the path back to healthy nails. Most clients take at least two months to see real results, so offering a package of four or five bi-weekly treatments is a great way to ensure some prepaid revenue and a full book, as well as to create good habits in your clients. By encouraging regular visits to your salon, your client will get into the bi-weekly mindset and be more likely to keep a regular booking schedule once her nails are repaired. How much should you charge? For add-on treatments a good rule of thumb for most businesses is $1 per minute. So a set of five 10-minute rehab treatments would cost about $50. Then, for the purposes of marketing psychology, change that $50 into $49 and you’ve got a perfect package price. For clients who are willing to pre-book their treatments with another service like a manicure, you can offer a special like 15%-20% off the package price when they book their add-on treatments with a regular menu service. Be sure to take pictures at each visit. Not only will it excite your client to see her progress, but it’s great for marketing on social media. Before, during, and after treatment photos are amazing marketing tools. Scottsdale, Ariz.-based nail tech Elizabeth Morris is an educator, distributor, financial consultant, and experienced salon owner. Her website, The Nail Hub, offers free podcasts, a blog, product store, and consulting services. Learn more at www.thenailhub.com.